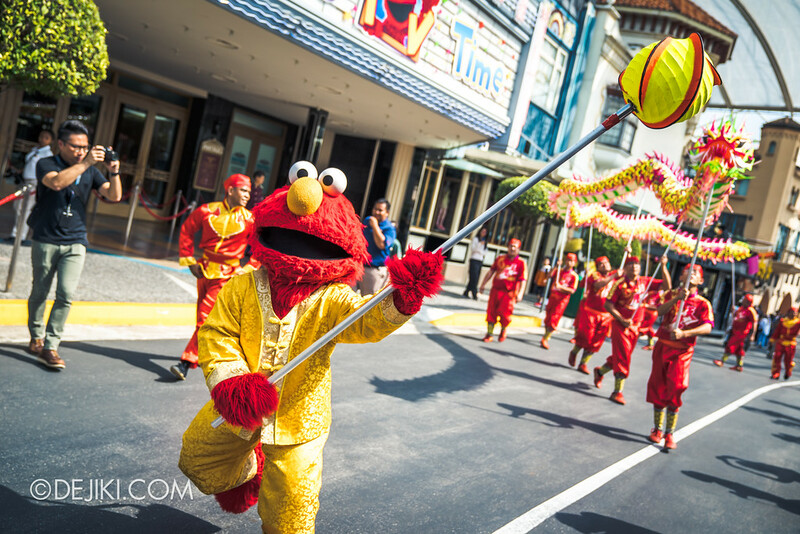 Celebrate Chinese New Year at Universal Studios Singapore’s Lunar New Year festive event! 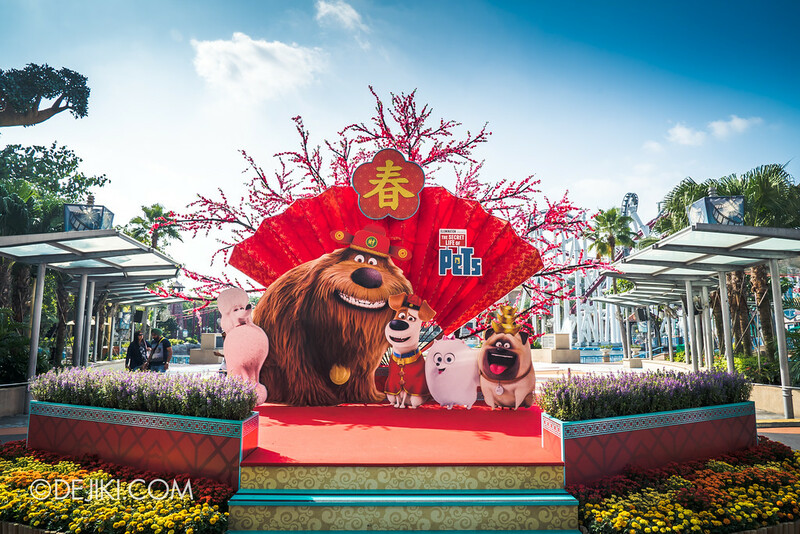 From 9 to 25 February 2018, Universal Studios Singapore will welcome the Lunar New Year with some all-new festive programming. 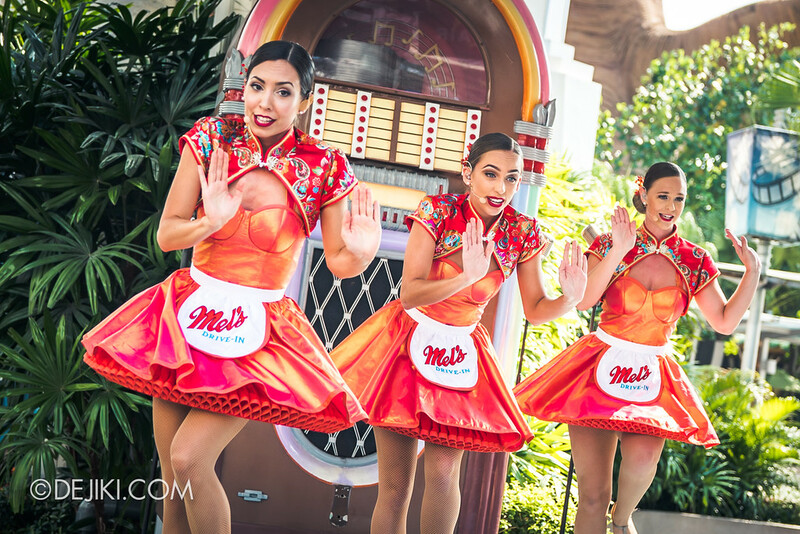 For the Mel’s Dinettes show at Mel’s Diner Stage, the trio will perform their usual hits with a festive twist. First, with that cheongsam-style mini jacket. 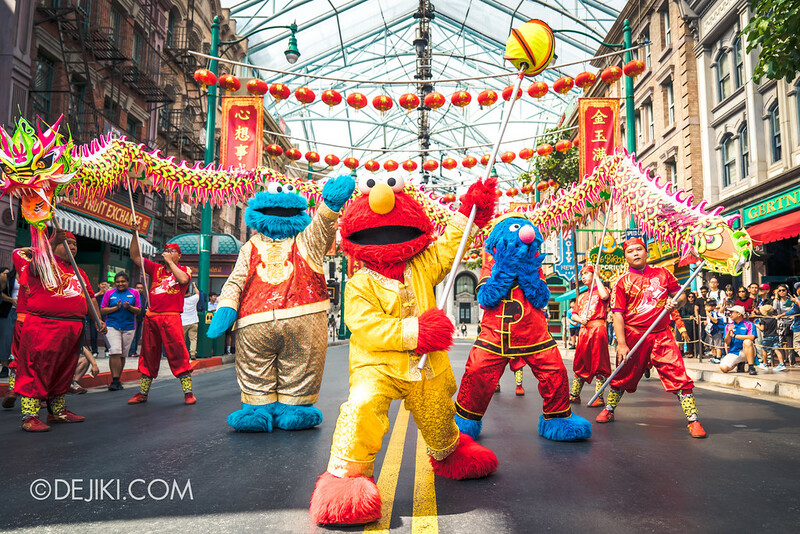 During the media preview, the only Lunar New Year change was a mash-up of two songs from the 1960s: “Land of 1000 Dances” and “欢乐今宵”. 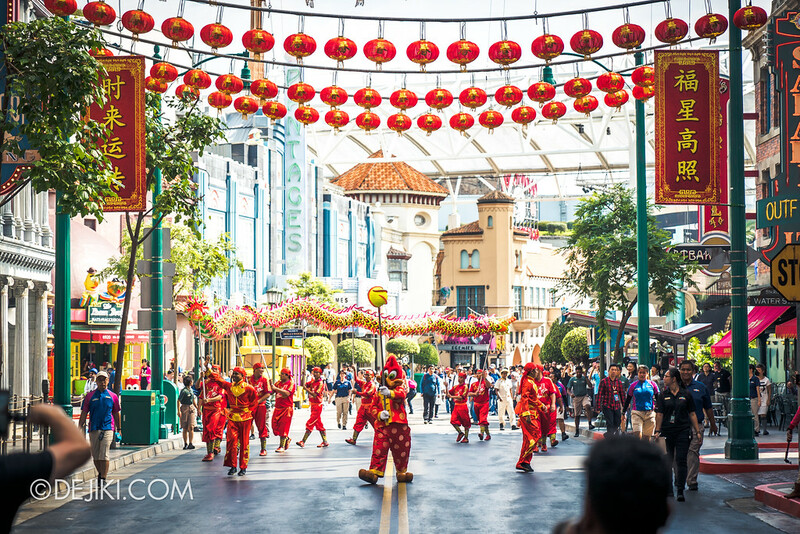 Headlining the park’s festive celebration is a new take on the chinese dragon dance, which starts from New York zone (Vine Street gate) and goes around Universal Studios Singapore. This is the first show that covers all seven zones of the park (Death March in HHN6 passes through Sci-Fi City without performance). 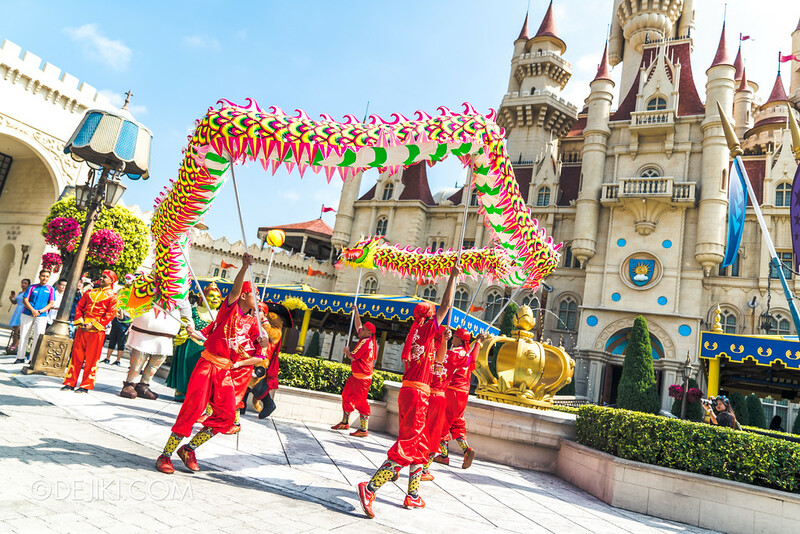 The dragon trail – performed by the professionals – will make several stops to meet characters from every zone, and sometimes the Pearl is briefly handed over to the park characters (and back). 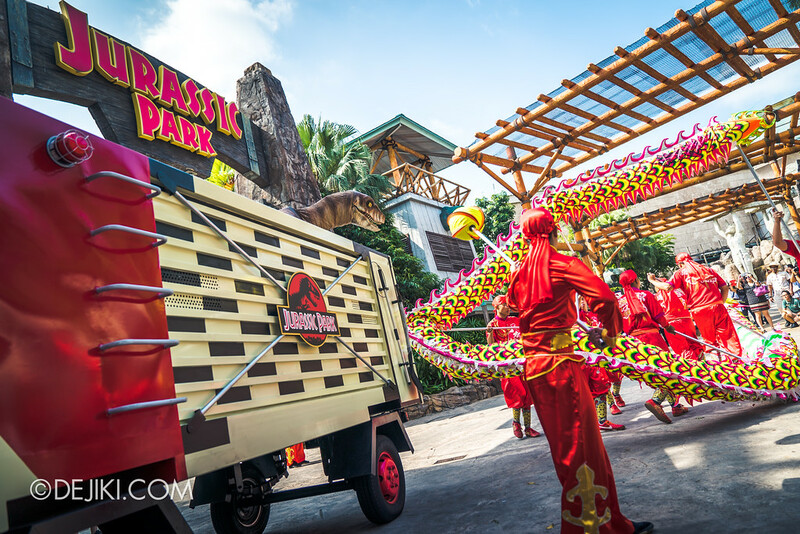 It’s not the usual theme park parade. 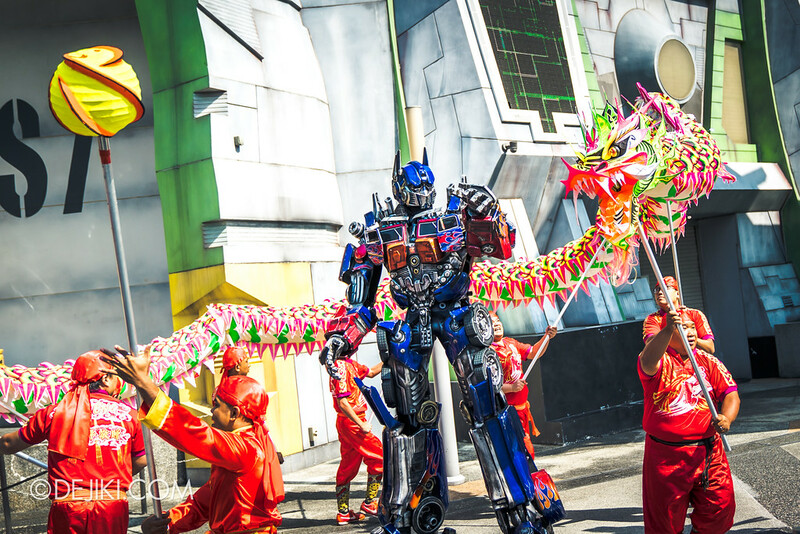 After Woody Woodpecker, there’s the Autobots at Sci-Fi City – they seem quite confused by the ruckus. 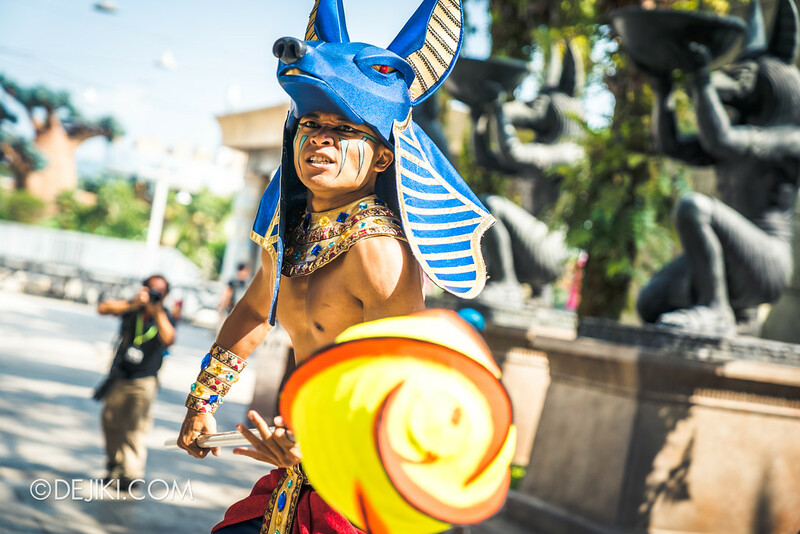 Anubis Warriors at Ancient Egypt. The Raptor with Many Names™ at Jurassic Park. Puss in Boots (Festive ver. ), Shrek and Fiona at Far Far Away. And, King Julien at Madagascar. 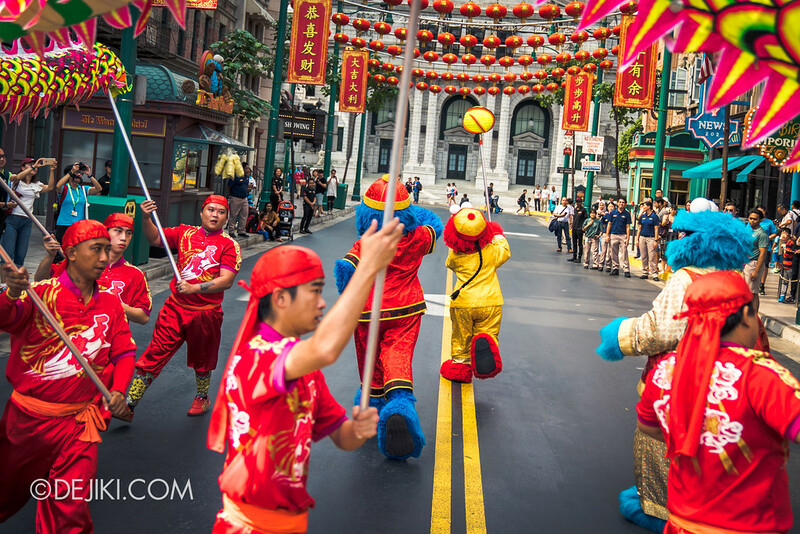 This performance is about 20 minutes long, so it’s not going to be a peaceful stroll around the park like the other parades. It’s pretty energetic (even with loud drum music to match), so be prepared to move quickly if you want to catch all the moments. Otherwise, you can stay behind to take photos with the other characters at the various zones. 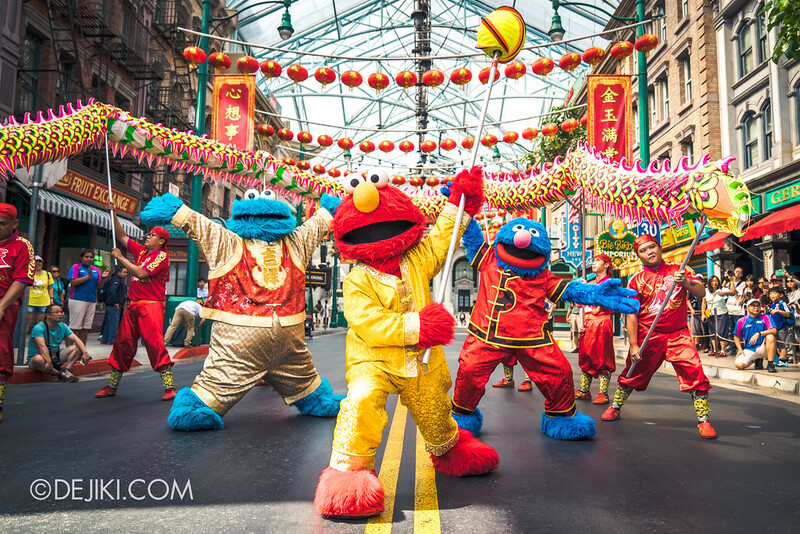 Elmo, Cookie Monster and Grover will lead the final leg of the dragon’s tour around the park. 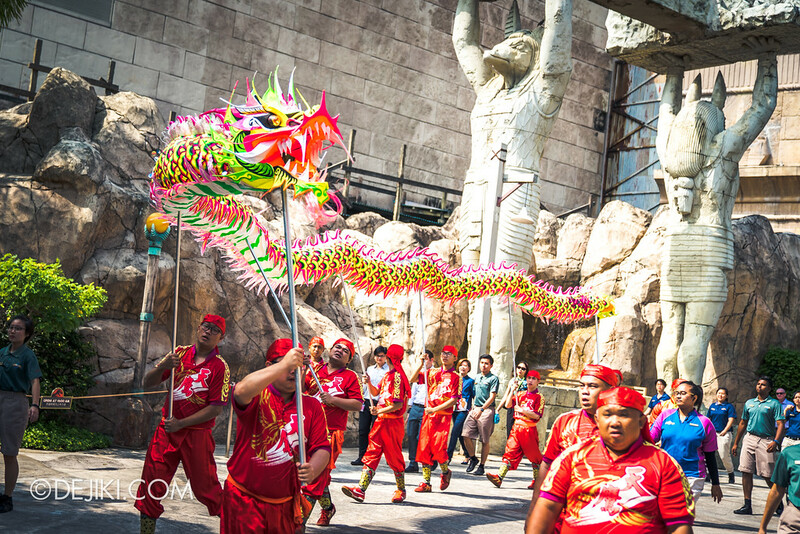 The Majestic Dragon Trail is performed twice a day during the festive season. 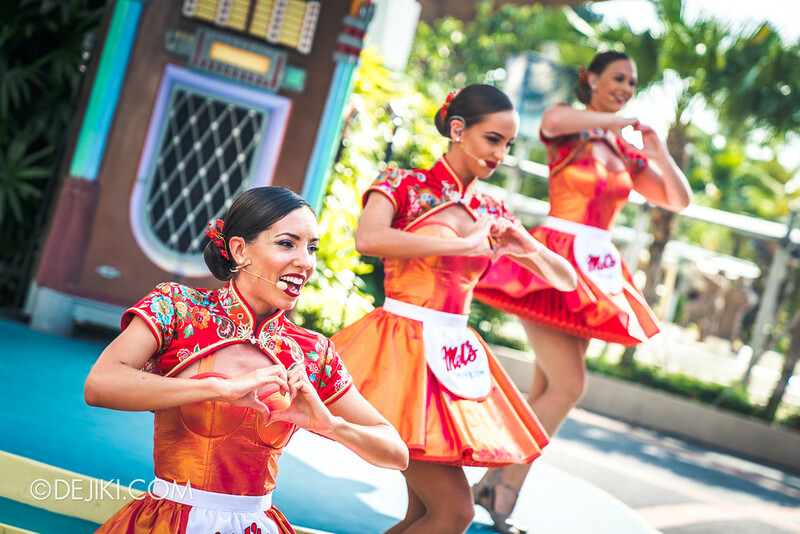 First show: 1:00PM or 2:00PM, then second show at 5:00PM or 5:30PM – check the park for timings when you visit. For a limited season, The Rockafellas will put on a brand new martial arts and acrobatics themed show, with projection mapping at the New York Library. 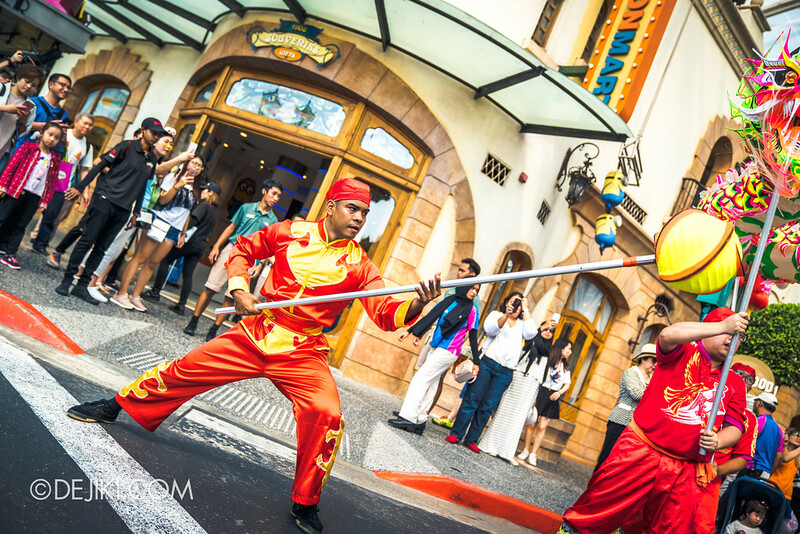 The Fu Fighters is only performed in the evening, with show times at 7:30PM (From 16 to 24 Feb, a second show will be performed at 8:45PM). 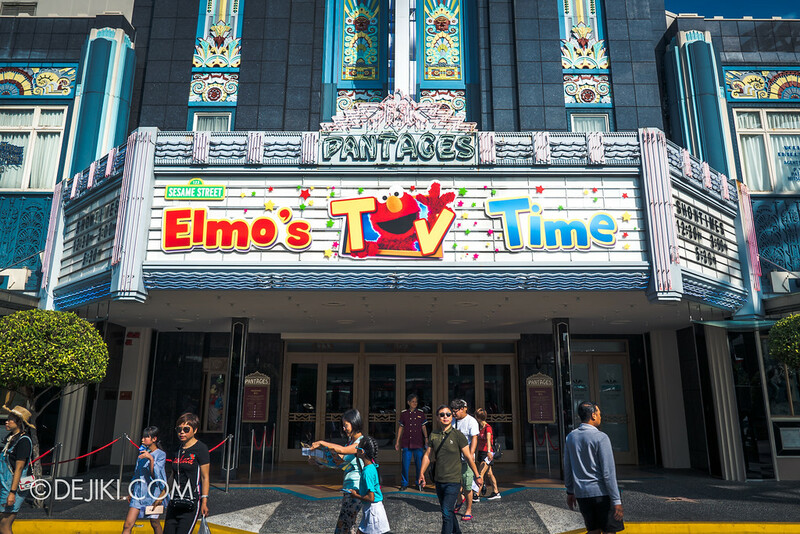 Sesame Street fans, check out Elmo’s TV Time, a new show for 2018 at the Pantages Hollywood Theater. 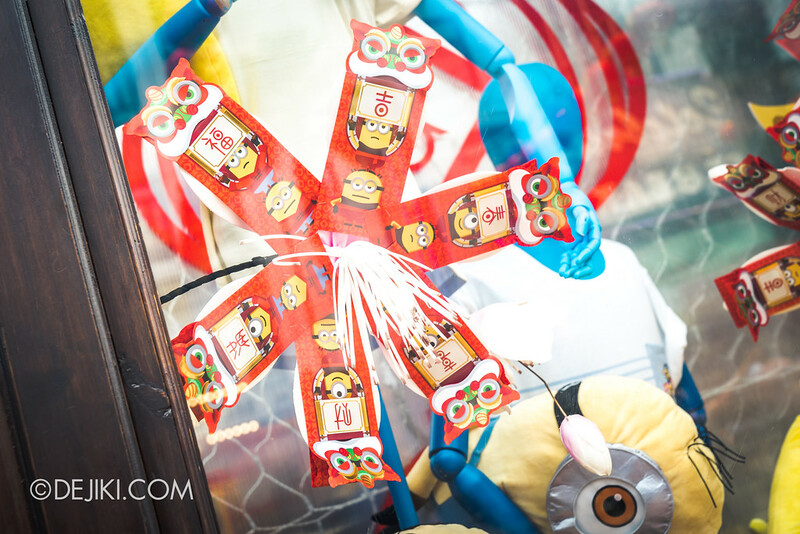 And this is the new red packet design for 2018. 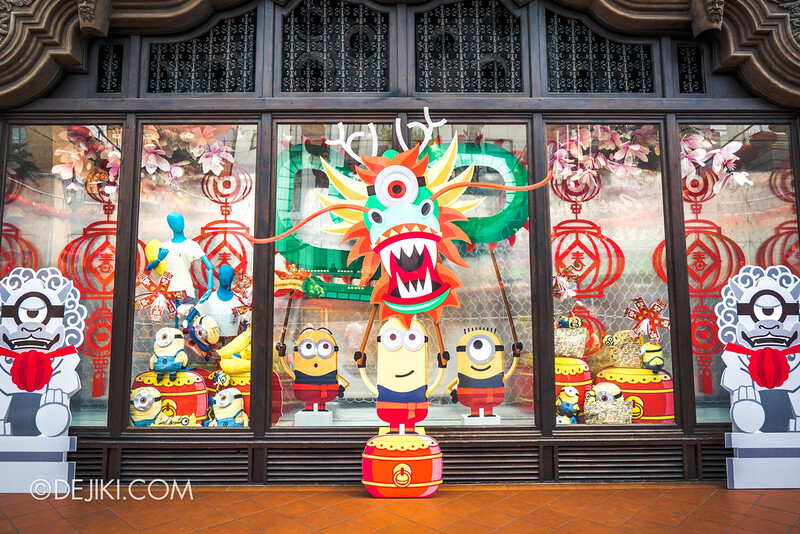 Park decorations for Lunar New Year is pretty standard now – lanterns and banners (from 2016?). 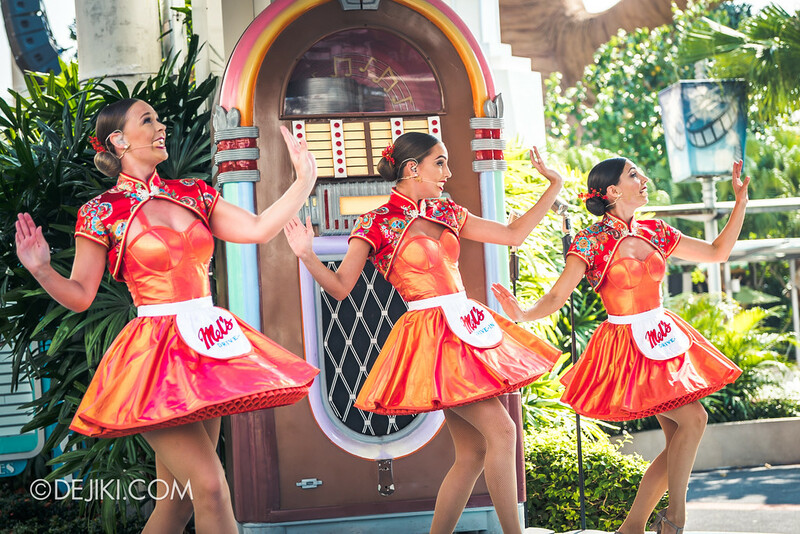 And yes, the park music has changed to match. 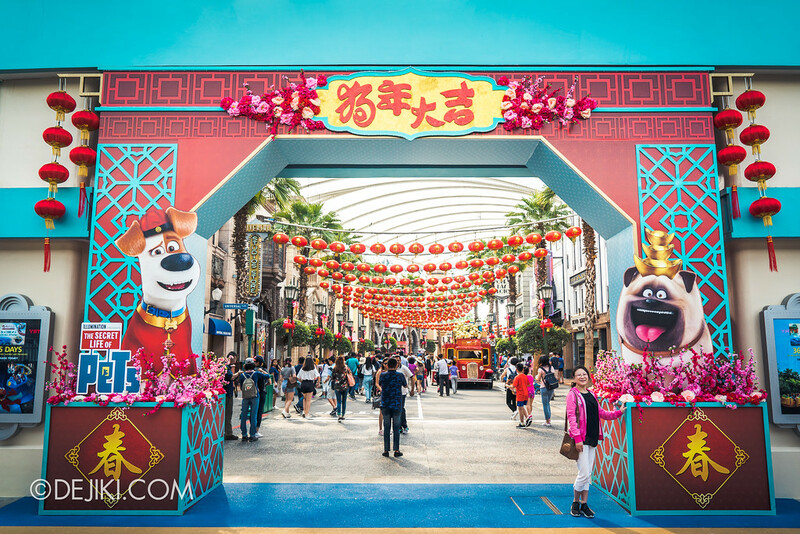 A simple arch at the entrance for this year. 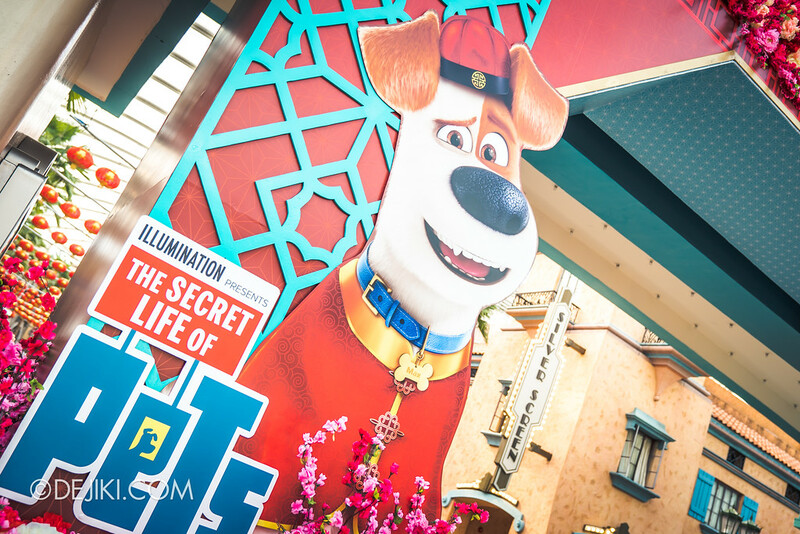 Secret Life of Pets – Hmm, Interesting. 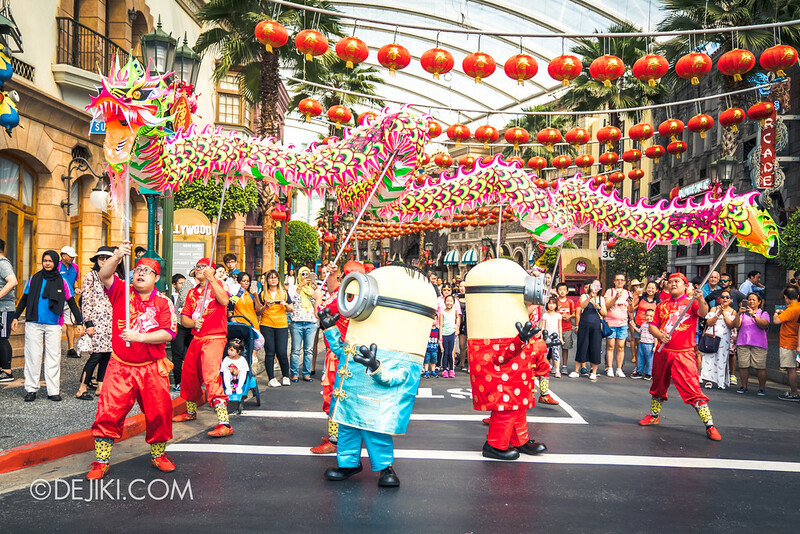 Will you be visiting Universal Studios Singapore during the Chinese New Year long weekend? Let me know what you think about this year’s mini festive event in the comments! 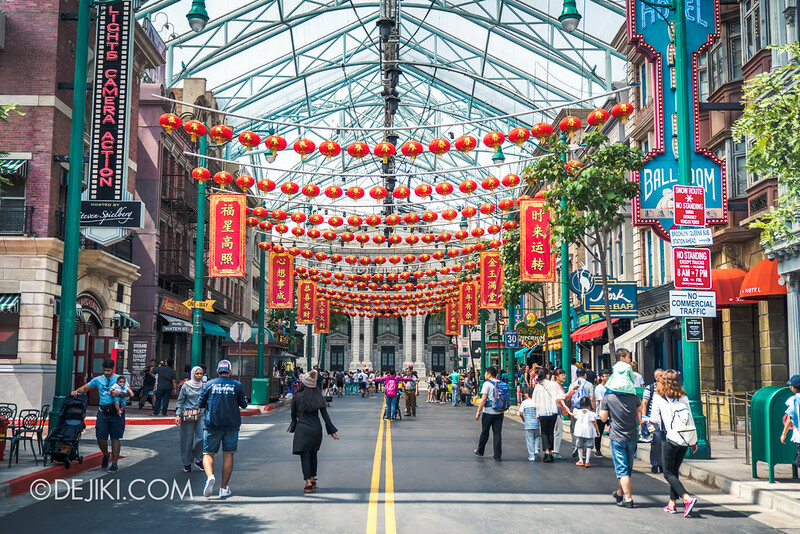 The Scorpion King float is finally back and operational in the Hollywood Dream Parade!